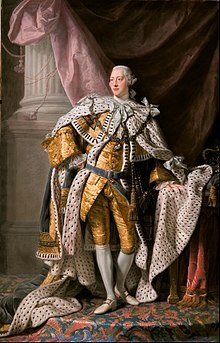 King George III (Born George William Frederick 4 June 1738 – 29 January 1820) was King of Great Britain and Ireland from 25 October 1760 until 1 January 1801. He was then King of the United Kingdom of Great Britain and Ireland until his death. He was also Elector of Hanover, making him a Prince of the Holy Roman Empire. During George's reign, he lost control of the United States of America. His two kingdoms Great Britain and Ireland were merged into the United Kingdom of Great Britain and Ireland. Also during his reign, Great Britain and its successor the United Kingdom were at war with republican and Napoleonic France. The Electorate of Hanover eventually became a Kingdom. George suffered from periodic bouts of mental illness. One of these caused a crisis in 1788, and attempts were made to nominate his son George IV as regent. He quickly recovered and prevented this. George signed the Quebec Act of 1774, abolishing William of Orange's anti-Roman Catholic laws in Great Britain's 13 North American colonies. Also during his reign George III signed legislation abolishing some of the anti-Catholic Laws in Great Britain and Ireland. For example, the Catholic Relief Acts of 1772 and 1774 allowed Roman Catholics to have land leases in Great Britain. A 1793 Irish Parliament bill called Hogart's Act allowed Roman Catholics to vote in Irish elections. But George still blocked a proposal in 1800 by the British Parliament to allow Catholics to sit in Parliament. In the later part of his life, George suffered from recurrent, and eventually permanent, mental illness. Although it has since been suggested that he suffered from the genetic blood disease porphyria, the cause of his illness is not certain. After a final relapse in 1810, a regency was established, and George's eldest son, George, Prince of Wales, ruled as Prince Regent. On George III's death, the Prince Regent succeeded his father as George IV. Because of "his plain, homely, thrifty manners and tastes", George has been nicknamed Farmer George. ↑ The London Gazette consistently refers to the young prince as "His Royal Highness Prince George" London Gazette: no. 8734, p. 3, 5 April 1748. London Gazette: no. 8735, p. 2, 9 April 1748. London Gazette: no. 8860, p. 2, 20 June 1749. London Gazette: no. 8898, p. 3, 31 October 1749. London Gazette: no. 8902, p. 3, 17 November 1749. London Gazette: no. 8963, p. 1, 16 June 1750. London Gazette: no. 8971, p. 1, 14 July 1750. This page was last changed on 26 March 2019, at 18:31.